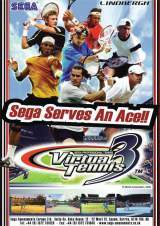 Virtua Tennis 3 - Sega Professional Tennis © 2006 Sega. The 3rd game in the series offers more realistc graphics and gameplay. Virtua Tennis 3 features the top players in the world from men's professional tennis, including four time Wimbledon champ, Roger Federer, along with Tim Henman, James Blake, Taylor Dent, Rafael Nadal and US favorite Andy Roddick. The format of the game sends players on a global tour to the Men's Single and Double Championships on some of the most famous courts in the world from France, US, Australia, and Germany. Players can also select from a list of 8 play styles, such as play base' line, serve and volley' and offensive.' 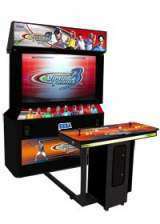 For the novice player, the game features a series of training and practice sessions. In these modes, Virtua Tennis 3TM coaches the player giving practice instructions and goals, such as performing six forehands, followed by six backhands, followed by a smash volley. 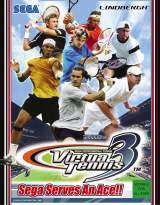 Virtua Tennis 3 was released in April 2006. The game is known in Japan as "Power Smash 3 - Sega Professional Tennis".